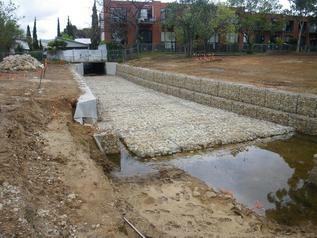 The DURA-FLEX river mattress is a low profile gabion made of galvanized double-twisted wire mesh and when filled with rocks at the project site, forms a flexible, permeable, monolithic structure for river bank protection and channel linings for erosion control. 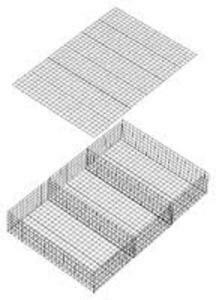 Gabion mattresses aka "RENO MATTRESSES" are constructed of 13 gauge (0.087") galvanized double- twisted mild steel wire mesh with a hex shaped mesh opening of 2-1/2" x 3-1/4" (6x8 cm) with heavier selvedge wire framing and conforms to ASTM A975-97 specifications . Mattresses are also available with a 0.5mm thickness P.V.C. coating to protect the mattresses from corrosion.